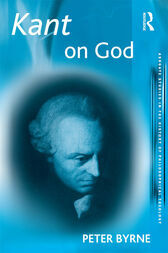 Peter Byrne presents a detailed study of the role of the concept of God in Kant's Critical Philosophy. After a preliminary survey of the major interpretative disputes over the understanding of Kant on God, Byrne explores his critique of philosophical proofs of God’s existence. Examining Kant’s account of religious language, Byrne highlights both the realist and anti-realist elements contained within it. The notion of the highest good is then explored, with its constituent elements - happiness and virtue, in pursuit of an assessment of how far Kant establishes that we must posit God. The precise role God plays in ethics according to Kant is then examined, along with the definition of religion as the recognition of duties as divine commands. Byrne also plots Kant’s critical re-working of the concept of grace. The book closes with a survey of the relation between the Critical Philosophy and Christianity on the one hand and deism on the other. Peter Byrne is Professor of Ethics and the Philosophy of Religion at King's College, London, UK.